My entire life, I've found it damned difficult to run distances. Since my days in grade school where we performed the 600 yard walk/run for the President's Council on Physical Fitness test, to distance running we needed to perform for football, I hated it. I was bad at it, and I've continued to be bad at it my whole life. Perhaps it is because I'm far more of a fast twitch person, or perhaps I was just weak and/or lazy, but my distance running experience and performance has been scant. But as I've moved to get myself in better shape, one thing seemed universal - those in truly great shape ran. Certainly there are exceptions to this, but to me it certainly seemed the rule. Hence, I needed to get off of my life long aversion to running and figure out a way to do it. The first place I needed to start was with a goal, and it seemed that a good goal would be to participate in a run. Since my company is a major sponsor of the Bellin Run (a famous 10k in the Green Bay area) and since the run was a 10k (a distance that felt achievable), it seemed to be a good goal to have. Pus, since it would be conducted in June, it would give me the time I'd need to be able to get into shape to run the 6+ miles. But where to start? And that's where the 10k Runner app comes in. Downloaded for my iPhone, the app is a 14 week process that takes a runner from the couch to a 10k by combining running and walking to build strength and stamina. The slow, stair step process has been a wonder. When I started, the app had me walking a minute then running a minute over and over again. And, slowly, the amount of time spent running has increased, and the amount of time walking has decreased. I'm now running 25 minutes straight. I'm not fast, mind you, but this was something I could not have done just a couple of months ago. I'm running over 2 miles a session right now. Prior to 10k Runner, the most I ever ran in my life was a mile. And that was in High School. My body has totally changed, and it is most noticeable in my legs, which are substantially thinner and much more toned that when I started this process. I have a long way to go to get to a 10k. But I feel like I'm on a good path, and my confidence as it applies to running has never been this high. 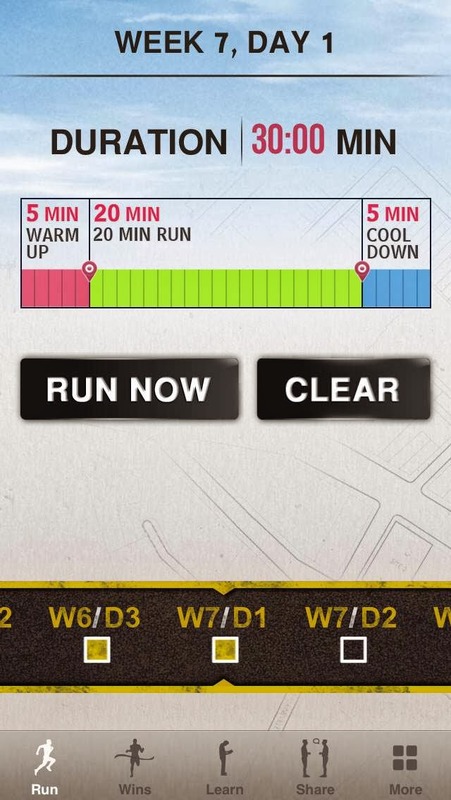 I strongly endorse this app for someone wanting to train for a 10k, especially if they are a non-runner to begin with. Coke's Super Bowl Ad - Awesome or Awful?